On 24th of November 2015, Bucharest hosted the first Cinema 4D event, organized by IRM Ltd in cooperation with Maxon. The world famous Cinema 4D presenter and artist Glenn Frey took our guests to an hour and a half walk through the World of Cinema 4D, showing a small, but quite impressive part of what is possible to be made with one of the leading software solutions for 3D animation and visualization. In this short time he not only managed to tell how he got captured by this easy-to-use 3D software, but also to show some of the amazing works done with the program. Glenn has demonstrated how easy and fast it is to design a character and make animation yourself. От ноември 2015 г. е добавено изменението DIN 1054/A2-2015-11 към DIN 1054:2010-12. Това изменение съдържа в частност по-високи стойности на коефициентите за сигурност, приложени към напорните сили при благоприятна и неблагоприятна земна основа. Тези коефициенти вече са на разположение в програмите, които извършват проверка на хидравличен подем: DC-Cantilever, DC-Pit и DC-Underpinning. The winners of the 2015 “The Art in Structural Design” contest have been revealed. The competition showcases unique constructions and innovative achievements from the world’s top engineers. IRM ltd., in cooperation with DC Doster and Christmann GmbH and the Chamber of Engineers in the Investment Design, organized aroadshow to present its software solutions for slope stability. 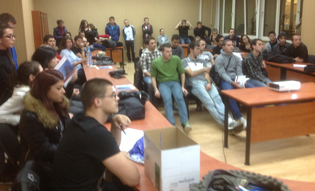 More than 120 people attended our presentations in Varna, Veliko Tarnovo, Gabrovo, Smolyan, Plovdiv, Burgas and Sofia. Деветнадесет студенти се включиха в курса "3D BIM проектиране с Allplan", който се провежда в момента в Архитектурния факултет на УАСГ.